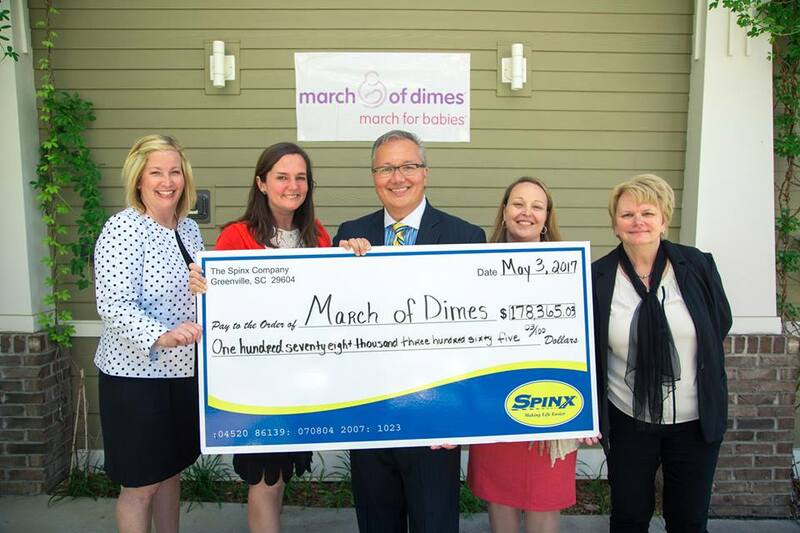 Spinx stores collectively raised $164,448 for March of Dimes during the month of March. The money raised helps area moms have healthier pregnancies, assist families with newborns in the Intensive Care Units, as well as help fund research to fight birth defects and premature birth. This year’s donations also showed over a 6.5% increase in overall customer participation. Each of the 82 Spinx convenience stores contributed to the total donation amount by encouraging customers to donate to March of Dimes while making their purchases at the counter. The 1st place store located on Marue Drive in Greenville raised $11,000 with over 27% of their customers donating to the cause. This store not only contributed the largest dollar amount, but they also raised the most money company wide. As an internal ‘thank you’, Stan Storti, Spinx President and Steve Spinks, Spinx CEO will work for a day at the Greenville store. The 2nd largest donation came from the Fairview Rd. store in Simpsonville raising over $6,000 and 14.48% of their customers participating. “As a local company that was born and raised here in Greenville, we feel it is very important to support our community. By donating to the March of Dimes we hope that our contribution will help those that need it the most.” said Steve Spinks.